Are you team bat? Or team dolphin? Earlier this month at the Acoustical Society of America Conference two groups of scientists argued the finer points of each animal’s echolocation excellence. Things got heated, words were exchanged. But in this battle between the sonar specialists, which creature comes out the winner? 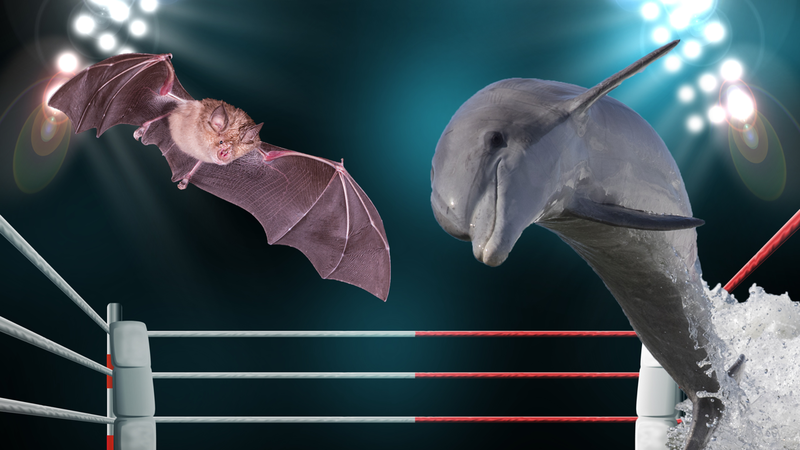 Check out a write up of the “Bats vs. Dolphins” debate by the Acoustical Society of America. Read an article about the sonar feud on Scientific American. If you can’t get enough animal acoustics, check out Laura Kloepper’s SciFri activity on burping bioacoustics! Laura Kloepper is an Assistant Professor in the Department of Biology at Saint Mary’s College in Notre Dame, Indiana. Brian Branstetter is a research scientist at National Marine Mammal Foundation in San Diego. IRA FLATOW: This is Science Friday. I’m Ira Flatow. So are you Team Bat or Team Dolphin? Of course you don’t know what I’m talking about yet. Here’s the deal. One mammal uses sonar to navigate complex spatial environments through the air, right, like a bat. While the other uses underwater sonar to find fish hidden beneath the sand, like the dolphin. But whose sonar is superior? Bat or dolphin? Well earlier this month at the Acoustical Society of America conference, two groups of scientists argued the finer points of each one’s echolocation excellence. One sided with Team Dolphin. One sided with Team Bat. Things got pretty heated. Words were exchanged. And so we thought– we know how to settle this. With a good old fashioned Rumble on the Radio. And so I bring you Science Friday’s Sonar Smackdown. In this corner, representing Team Dolphin, we have Brian Branstetter. He’s a research scientist with the National Marine Mammal Foundation in San Diego. Welcome to Science Friday. BRIAN BRANSTETTER: Hi, thanks. Glad to be here. IRA FLATOW: This corner, representing Team Bat. We have Laura Kloepper, assistant professor at St. Mary’s College in South Bend. Welcome back to Science Friday, Dr. Kloepper. LAURA KLOEPPER: Oh, thank you very much for having me, Ira. IRA FLATOW: You’re welcome. And we want– if you’re listening– we want you to let us know on Twitter if your Team Bat or Team Dolphin. Tweet us @scifri. And we’ll try to keep score. Very, very interesting. OK. Now for you folks contemplating Team Dolphin, this sound made by a dolphin. So which one do you prefer? Team Bat or Team Dolphin? Before we start pulling any punches, let’s hear each side’s best case for why your animal has the best sonar in the animal kingdom. Laura, you’re first up for Team Bat. Give us your case. LAURA KLOEPPER: All right. OK. Well, first of all, I think the listeners hopefully will clearly agree that just by listening to those two sound files, the bats sound pretty dramatically different than the dolphins. And that’s because the bat’s signals are about 20 times longer in duration than the dolphin signals are. And by using our ears just from that sound clip– which by the way was slowed down about to 10% its original speed– you could hear the differences in the sounds. And the bat calls have this really beautiful way that the pitch, or the frequency, of the calls change over time. And we call this– In the science world, we call this frequency modulated. So they have this ability to change how their frequency moves over time. And dolphins really don’t have that ability. Their sounds– it’s pretty boring. It sounds just like a click, right. It sounds like you’re snapping your fingers together. So first of all, bats have the advantage with flexibility in terms of their signal design. And we have lots of scientific evidence that bats modify their echolocation signals, depending on their behavioral tasks. So they have a lot of control over how they can change their echolocation calls, both in the frequency and in the time. Oh, absolutely. They’re the original echolocators. So they evolved– it depends on the methodology you’re looking at– but it’s estimated that they evolved echolocation about 65 to 85 million years ago versus dolphins evolved echolocation only a mere 32 million years ago. And then when we start looking at the number of species, bats far surpass the echolocating toothed whales. In that bats– we know, we know there’s still many species we haven’t identified. But there’s over 1,200 species of echolocating bats that are found on every continent except for Antarctica. With dolphins we only have 73. LAURA KLOEPPER: I could go on. But I think maybe we should let Team Dolphin take their chance. IRA FLATOW: –all right. Well, you’ll have the chance. Let’s let Brian– Brian, she called you– “boring” is the word that she used for dolphin. BRIAN BRANSTETTER: Well, we’ll see about that. First of all, I think we need to take bats and maybe send them back in time and let them evolve an extra 100 million years. And maybe then they might catch up to what a dolphin can actually do. We’re going to start off with something very, very basic. How far away can you detect a target? Now bats, they can detect targets around three to five meters. That’s their maximum range. And that’s not very impressive. A dolphin on the other hand, it can detect a golf ball-sized sphere out to about 73 meters. They can detect a baseball-sized sphere to about 113 meters. And that’s just a bottlenose dolphin. If you were to throw another toothed whale into the group, say a sperm whale. A paper just came out yesterday that suggests that they could actually detect targets out to almost a kilometer. So if you want to do a quick comparison there– a bat, three to five meters. A bottle nosed dolphin, longer than a football field. And a sperm whale, almost a kilometer. I think everyone’s going to agree that #DolphinBiosonarRules. And you guys can put that in your Twitter feed, if you want to. IRA FLATOW: Dr. Kloepper what do you say to that? LAURA KLOEPPER: Well, I think, you know, Brian does have some very valid points. But I think it’s also really important to point out that sound moves much differently in water than it does in air. And so dolphins will always have the advantage with target detection range because of the physics of sound. In that sound moves faster in water. And the way that sound moves between how the dolphins make their sound and into the water is a little bit more efficient than bats. So we’ll give dolphins the win on that. But you really are comparing apples to oranges with the comparison that he used with the ability to tell a target at a greater distance. So the other thing to point out is that bats most often use their sonar in very complex environments versus dolphins are usually doing it in the open ocean. So dolphins have a pretty simple task. They just need to figure out where a fish is versus bats are trying to detect a small insect from within a very complex often forested environment. IRA FLATOW: They just have to do that. How do you like that, Brian? They just have to do that. BRIAN BRANSTETTER: Yeah, maybe that’s all they have to do. But if that was it, they wouldn’t have this crazy capability to do a bunch of things that bats just can’t do. One of the main ones is when a bat is echolocating on a target, it’s only going to get surface features of it. The echolocation signal cannot penetrate the target. For dolphins, on the other hand, because they are in water, their echolocation signal can actually penetrate the target. So they can get a lot of information that bats can’t get, such as how thick an object is, whether or not objects have different fluids inside of it. For example, a really cool experiment that was done was, we have three cylinders. They’re geometrically identical. Except one has glycerin in it, one has alcohol, and one has water. Dolphins can tell the difference between these, no problem. Bats cannot do that. Another really cool experiment is dolphins can echolocate on cylinders that, again, are geometrically identical. Except the cylinder wall thickness varies by as small as 0.2 millimeters. That’s about twice the width of a hair. It’s visually difficult to see the difference. But bats can echolocate on it and tell the difference– Excuse me, dolphins can echolocate on that and tell the difference. But bats cannot because their biosonar cannot penetrate targets. IRA FLATOW: Our number, if you want to phone in on this. And besides, you can tweet us. Which do you prefer? Oh, which radar or sonar do you prefer? You can tweet us @scifri. Or you can give us a call. 844-724-8255, is our number. Let’s move on. So far, it seems like a tight match-up. Let’s move on to prey detection. How are each of these animals able to use this sonar to catch a meal? Laura, you go first. LAURA KLOEPPER: OK, sure. So with the bats that I’m primarily talking about– I’m speaking about bats that collect insects. So they hunt for insects using their sonar. And so what these bats have is they have some pretty remarkable abilities with detecting their prey using their sonar. So Brian did mention that dolphins may have the upper hand with determining what an object is made of. But bats can even tell– they can tell the fluttering of a very, very, very small prey object. So they have the ability to detect really small details of their prey. So that they can determine whether it’s a moth that they want to eat versus some other insect species. The other thing to point out too is that bats often fly at really fast speeds. And when you start thinking about sound and speed, your brain might take you back to high school physics. Where you might have learned about the Doppler effect, which is that when you’re a moving object, and you’re making sound, the pitch of the sound that you’re making is artificially increased in frequency due to the speed at which you’re traveling. That’s why ambulances, they change pitch to a stationary listener as the ambulance moves past. Well bats have this incredible ability. I like to say that they’re doing physics in their head. And they will actually adjust their echolocation signals depending on their flight speed to compensate for that. And last I checked, dolphins don’t have that ability. BRIAN BRANSTETTER: That is true. Dolphins do not have Doppler. But it’s because dolphins don’t need it. And this comes back to maximum range detection. Since bats are so horrible at detecting targets at range, by the time they actually detect an insect, it’s going to be three to five meters directly in front of them. They’re going to need to have information really fast about the behavior of that insect. Whether or not it’s flying away from them or flying towards them. And they can do that with Doppler. Dolphins don’t need that because they can detect a fish a football field away. They have plenty of time to swim over there, even produce some whistles and call their buddies over. You know, hey, let’s herd these fish into a nice tight ball and take our time, you know, maximizing our caloric intake. Bats can’t do that. And I don’t see Doppler as an extra cool thing that they can do. It’s just a compensatory mechanism. Because they have really horrible maximum range detection. IRA FLATOW: Laura, you want to answer that or should I go on to the next question? LAURA KLOEPPER: Well speaking of buddies, let’s talk about buddies. Right, so what bats are really good at is using their sonar in large groups. And when you start thinking about any sort of– whether it’s an animal or whether it’s some sort of synthetic technological device that’s using sonar in a group, where there’s other individuals making sounds and trying to hear echoes. You have this problem of sonar interference. And bats form some of the most dramatic aggregations on the planet. They can live in caves with millions of individuals that all leave the cave often at once, that are using their sonar. And so they have this ability to overcome what we think is an impossible task by using their sonar in a way that’s avoiding what should be interference from other individuals. And so far, we don’t really see that dolphins have the extreme ability to do what bats can do. And it really comes down to my first point, which is the flexibility in the signal design. Bats have the upper hand because of how flexible their signal design is, which allows them to adapt to a lot of different scenarios. IRA FLATOW: Brian, what about all that interference underwater from the sounds we keep hearing? BRIAN BRANSTETTER: That really hasn’t been studied in dolphins. I will give Laura a victory on one point. A lot of times the bat science is ahead of the dolphin science. And the reason for that is because you can just go up to your attic and grab a couple bats. You know, the accessibility, it’s really easy. No one’s really going to care. And if you actually read these papers, that’s exactly what they do. They go up to an attic, grab a couple bats. Well you can’t go in the backyard and grab a couple dolphins. So it’s a lot harder to do dolphin research. So jamming has not really been studied. Actually, Laura and I are the first people to actually study it in dolphins. But it’s brand new research. There’s a lot we don’t know about it. But, yeah, bats probably are better at jamming than dolphins are. Because dolphins pretty much don’t need it. They’re not living in a cave with seven million other bats. They are out in the ocean, usually in smaller groups. But sometimes they do form these super large groups. And, you know, it’s a topic of future research. IRA FLATOW: I’m Ira Flatow. This is Science Friday from WNYC Studios here with our Sonar Echolocation Smackdown, with Laura Kloepper and Brian Branstetter. Talking about who are better at doing what they do with their echolocation– bats or dolphins? Brian, you want to take it a step further? Have you got something else you’d like to throw in? You know, let’s talk about how does each animal actually produce the sonar. And who does it better, Brian? BRIAN BRANSTETTER: Well dolphins produce clicks in their forehead, just right underneath of their blowhole, right underneath their nasal plug. And if you look at the dolphin’s skull, it’s actually concave-shaped, kind of like a radar dish. So it’s going to reflect all that acoustic energy in the forward direction. Right in front of that, there’s a lipid structure called the melon. This actually acts like an acoustic lens, which further helps focus all that acoustic energy in the forward direction. If you could imagine going out into a football field and yelling, it might not be that loud. But if you used a bullhorn and focus all that energy forward, you’re actually going to increase the amplitude significantly. And if you look at bat echolocation signals, they’re only about 100 dB loud. It’s not that very loud. If you look at dolphins, on the other hand. Bottlenose dolphins, their echolocation signals are about above 200 decibels. If you want to talk about really loud, look at sperm whales. They’re echolocation signals are around 230 decibels. I think it’s the loudest animal sound on the planet. I think if it goes any louder, it starts converting water into vapor. But don’t quote me on that one. I’m not exactly sure about that. IRA FLATOW: It’s loud. Laura, how do bats make their sound? LAURA KLOEPPER: Well, Ira, bats make their sounds just like how we make our sounds. So they generate their sounds inside their larynx. And then depending on the species of bat, they either emit the sound through their mouth or through a special nasal structure. So basically through their nose. But they’re generating the sounds the same way that we do. What’s really interesting about the sound generation of bats is that they have pretty remarkable control. Again, coming back to this flexibility. The point I keep making over and over again. They have a lot of control over the size or the shape of their emitted sonar beam, based on the size of the opening of the mouth or the size of the structure in their nose that’s generating it. So, yeah, maybe they don’t make as loud of sounds as the dolphins do. But they have much finer control over the shape of the sonar beam with the soft tissue structures that they have on their head. IRA FLATOW: Garrett in Greenville, Georgia. Quickly get your question in before we have to go. Hi, welcome to Science Friday. GARRETT: Hello. Thank you. I was just wondering, how much of the brain capacity is dedicated to echolocation in the bat and versus the dolphin? IRA FLATOW: All right. Super quick answer. How much? Brian? BRIAN BRANSTETTER: I have no clue. That’s a topic for future research. I mean, I think they’ve done more of that research with the bat. But it’s hard, you know, it’s hard to do that with dolphins. So that’s a really good question. But that’s a topic of future research. But I will tell you, a dolphin brain is about 1,500 grams. And the entire bat weighs about 20 grams. So we’re talking about a massive brain with a dolphin, and not much going on with a bat. IRA FLATOW: Oh, OK. Oh, whoa. Cheap shot. Laura. LAURA KLOEPPER: Well you know, Brian, size doesn’t always matter. Size doesn’t always matter, Ira and Brian. IRA FLATOW: OK. We’re going to have to leave it there. Brian Branstetter is a research scientist with the National Marine Mammal Foundation in San Diego. Laura Kloepper, assistant professor at St. Mary’s College in South Bend. Thank you both for being such good sports today on Science Friday. LAURA KLOEPPER: Oh, thank you, Ira. BRIAN BRANSTETTER: Thanks for having us. Bioacoustician Laura Kloepper uses ziplines, drones, and hawks to decode the mysterious communication of bats. Can Studying Dolphins Give Insight Into Human Disease? Dolphins can switch in and out of a metabolic syndrome that resembles pre-diabetes in humans.